Pine nuts have long been a part of the American diet, dating back to the Native Americans, many of whom consumed pine nuts as a staple product. In many parts of the world, pine nuts are considered a delicacy and have grown into a $100 million market. The United States imports approximately 80% of our pine nuts. Although pine nuts are called nuts, they are actually seeds located between the scales of pine cones. Once harvested from the cone, pine nuts must be shelled and consumed shortly thereafter. Despite their humble size, these little seeds are an abundant, healthy source of fat. Eatnuts.com Pine Nuts can be eaten raw or roasted to create a sweet, nutty flavoring and crunchy texture. There are many different uses for pine nuts, as they are a convenient standalone snack as well as the perfect addition to veggie dishes and sauces. Pine nuts have a similar nutrition profile to those of nuts, including levels of monounsaturated fats, antioxidants and lutein. When considering fats to avoid, eliminate the highly processed fatty foods and opt for pine nuts as a healthy monounsaturated fat source. 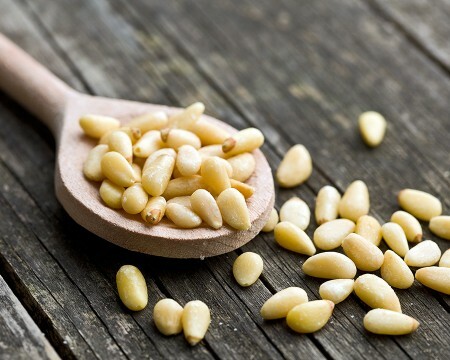 Below are a handful of benefits you can derive from adding pine nuts into your diet. Pine nuts are one of nature’s good sources of fat. Research has shown that the fatty acids from pine nuts lead to the release of high amounts of cholecystokinin (CCK), an appetite-suppressing hormone. Pine nuts are an excellent source of magnesium, which is one of those nutrients in which many Americans are deficient. They also contain monounsaturated fat, protein, and iron, all of which can help boost energy levels. Pine nuts have the perfect synergistic blend of nutrients and compounds commonly known for supporting heart health. This list includes magnesium, monounsaturated fats, vitamin K, vitamin E, and manganese. Pine nuts are packed with antioxidants and vitamins A, B, C, D and E in as well as lutein. Antioxidants support out bodies with combating free radicals, which are at the heart of age-related deterioration. Additionally, copper is present in pine nuts and is also known to prevent aging. Pines nuts are a popular, nutritional ingredient in the preparation of gluten-free food. For people diagnosed with celiac disease or for those who have allergies/sensitivities to wheat, pine nuts serve as a healthy, gluten-free ingredient. The manganese in pine nuts helps your body maintain its hormone balance and connective tissue strength. The zinc found in pine nuts supports your immune system and aids in any wound healing. The very generous levels of Vitamin E and K found in pine nuts have a positive effect on the cardiovascular system. The vitamin K allows you to form clots and prevent excessive bleeding after an injury whereas the vitamin E helps to produce red blood cells essential for oxygen transport. Pine nuts have high levels of lutein, which helps our eyes filter out UV light that can damage the macula. Lutein helps prevent our sight from deteriorating over time. Moreover, the beta-carotene in pine nuts converts into vitamin A, which is great for sustaining the overall health of our eyes. Eatnuts.com Pine Nuts are a wonderful addition to your diet, especially if you already enjoy eating nuts every day. A pine nut’s flavoring lends itself to being added to a variety of side dishes or main courses. They are used by vegans and raw foodists when making sauces like Pesto sauce or a creamy salad dressing. Pine nuts can also replace croutons on a salad. For those short on time, a simple handful of pine nuts can provide a plentiful array of a healthy fat, vitamins and minerals.